Enjoy this light-hearted unicorn 5 reel and strive to jump over the rainbow to earn yourself some lucrative cash rewards. There’s a multitude of endearing colours, characters, and symbols for you to check out these slot games, along with a unique gamble feature that enables you to stake your winnings and risk it all. Eyecon first started in 1997 and two years later they built their first online casino system. Since 2003, Eyecon made a name for themselves with their high-quality online slot games, many of which we feature here at Wizard Slots casino. Their team is filled with creativity and always comes up with new themes to enhance their long list of launched games. Eyecon has become very popular amongst their players as you can feel the passion for game development in each of their titles when they play on our slot games today. Join this trip to a magical world full of cute and adorable creatures welcoming you with a warm smile on their faces. 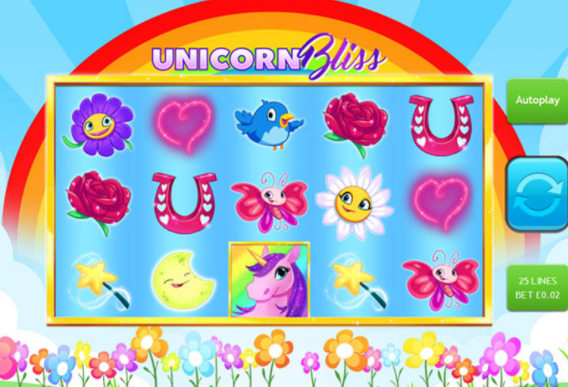 Unicorn Bliss is themed around the adorable world of rainbows and unicorns and filled with golden prizes to be found. In the background, you can see the rainbow and a field of flowers on a sunny day in the land of magic. The reels are packed with colourful symbols and the stylized art style makes everything look extra cute. Other than this game, take a peek at ourtop 20 UK slot games list. On the 5 reels and 3 rows you will find pretty white and yellow flowers, a lovely red rose, a friendly pink butterfly, a magical wand, a smiling bird, a bright star, a cute moon, a shiny sun, a lucky horse shoe and a pink heart. Nothing is missing out to make this cuteness complete. The wild is represented by a rainbow and can land anywhere on the three middle reels. It will replace every other symbol except for the scatter. If the rainbow makes part of a payline your winnings will be doubled. They always said that you could find gold at the end of the rainbow. Look out for the most fantastic creature of them all - the pink unicorn. It represents the scatter and if you land three or more of them in a spin you can win 5, 10 or 50 times your stake. You will also be rewarded with 15, 20 or 25 free spins that can be retriggered 15 times, so there will be chances to earn a massive 400 free spins! There are 25 paylines of fabulous combinations in this adorable world. If you place a minimum bet of 25p or up to 12.50 pounds you can enter the land of imagination and meet all the magical animals. This video slot has very basic mechanics but can lead to great entertainment. Unicorn Bliss is filled with adorable creatures and sweet payouts. The pink unicorn will guide you to fantastic free spins and the rainbow holds gold for you. With its cute aesthetics and magical soundtrack, Unicorn Bliss has a fabulous gameplay experience waiting for you to discover. Everything in this game is peaceful and friendly, welcoming you with warmth and lovely wins.